We are the renowned Suppliers of Coleus Forskohlii Plant Planting material and Dry Coleus Roots in India. Coleus is a crop that gives quality returns, as its every part is sold, from shoot to root. We procure handsome profit on selling its roots but an additional bonus is its shoot part, which is used as planting material. Coleus Forskohlii Herb available with us is used in urinary ailments. It also reduces the Blood pressure. Forskholii is extracted from coleus dry roots and it is an important constituent found in medicines related to heart. We also offer K-8 variety of Coleus planting material and provides support in selling and buying dry coleus roots. Note : We supply Coleus cuttings in every quantity whether it is 10 plants or in Thousands & Lacs. Therefore buyers looking for Coleus Plants in small quantity can also order the plants. Other than providing genuine planting material of Coleus, we purchase and sell Coleus dry roots from many states of India and supply to the needy. In addition, we provide the Contact details of genuine persons engaged in buying Coleus in every form. If genuine planting material of Coleus of K-8 variety is used, the growers get a yield of 6-9 quintal roots in the first season and 2 - 5 quintal roots in the second season. That means 10-12 quintal roots can be easily obtained which provide good amount of money & also planting material for acres, which is a bonus(Depending on cultivation methods & other factors at Field). Majority of farmers fail in Coleus farming as around 90% people never are supplied the authentic planting material & therefore only authentic planting material is supplied by us. Coleus is harvested in December when planted in July- August. It is also harvested in July-August when planted in December. In short, it is a 180 day crop. After harvesting, the shoots are cut and planted again and the roots are dried well after cutting in 1-1.5 inch pieces. After the material is cut, it is sold and if the grower wants to store the material, the dry roots can be stored for about 5-6 months. Proper irrigation is required for this crop so that the plants and roots can be developed properly. Precise amount of moisture should be maintained in the soil and excess watering is strictly prohibited. Genuine planting material of K-8 variety should only be used for planting to have the desired production. About 22000-25000 cuttings of about 6 inches are required for planting. Once sown, the planting material develops rapidly. 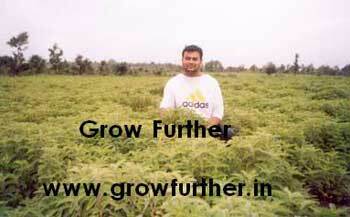 Both growth treatments are essential for this crop as we get money from selling of roots and whole plant also. Usage of the products recommended by us can give marvelous returns. Raised beds are required for Safed Musli production to prevent water logging and for the proper development of the roots. Sowing is done in July-August and the other time is in December-January. After a proper plough, growth promoters & other essential nutrients are mixed well and then raised beds are made.